Over the past few years, specialists have taken over many of the responsibilities that primary care physicians or general practitioners previously held. This shift has doubled specialist referrals, yet specialists aren’t reaping the full benefit because an estimated 50% of referrals are never completed due to challenges with provider-to-provider communication, among other factors. 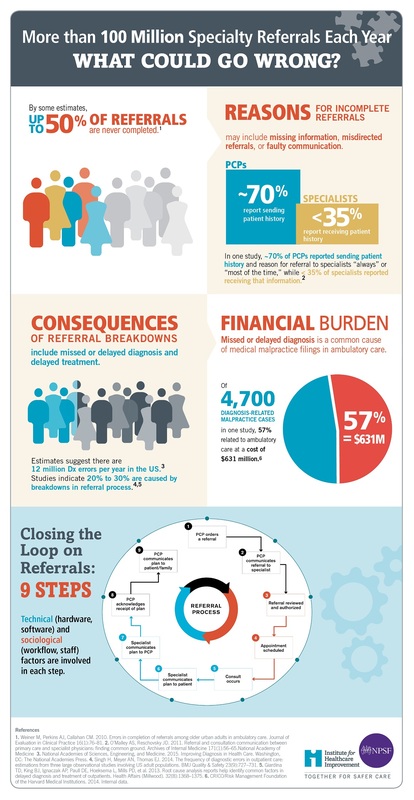 Because providers sometimes don’t share results or patient information effectively with each other, the referral process doesn’t work very well in practice. The lack of visibility throughout the process is a huge challenge. For example, a referring provider often has no idea whether a patient has scheduled an appointment with a specialist following their visit and may not receive an update until they see the patient again. Patients may have several specialists who need to coordinate care, yet important information can get left out in transit as providers struggle with administrative or technological challenges. A recent study by the American Medical Association found that every hour spent with a patient creates two additional hours of paperwork. Providers are finding it hard to keep up. Likewise, patients don’t want to deal with the headache of scheduling an additional appointment, transferring their records and checking back with their primary care providers. The process is broken, and ultimately, patient care is slipping through the cracks. Through current methods, providers can lose or forget to copy information when transferring sensitive patient data. This is a huge threat to patient care. In fact, up to 80% of serious medical errors relate to miscommunication during transition of care between medical providers, leading to more adverse events, more hospital readmission, more unnecessary duplication of care and higher costs. With the rise of specialists, who now outnumber primary care physicians four to one, providers need to seriously rethink their transfer process of sensitive patient data. Switching from a primary care physician to a specialist’s treatment has become a regular process, and how sensitive patient data is shared needs to improve with it. The Updox platform offers an array of solutions that keep provider communications in a centralized inbox for improved care coordination and a more seamless workflow process while integrating with countless EHR systems. Physicians can use Updox for direct provider-to-provider messaging, appointment reminders, self-service scheduling, patient engagement tools and more to improve the referral process. The Updox directory, which connects more than 1.5 million other vetted healthcare providers, supports secure communication and patient information exchange between referring physicians and specialists. With Updox, providers can easily manage all communications, including secure email, secure texts, referrals, faxes and more, from a single web-based dashboard to improve the efficiency of the office and streamline the referral process. Updox also allows users to share and track lab results, radiology images, care plans and prescriptions to lessen the likelihood of potentially dangerous errors. Our solutions help eliminate the duplication of tests and procedures, and reduce adverse medication reactions. Download our White paper for Independent Practices to learn how our specific solutions can have an immediate impact on care collaboration and outcomes for your healthcare team.